The GDPR 2018 brought a once-in-a-lifetime change to the legal basis on which individuals share their data with organizations. Brands are ensuring that their data-driven practices are in line with the regulation, but what do consumers think of the new law? How do they expect their data to be used and do they intend to exercise their new rights? Providing a stellar customer experience starts with having good data - data that is clean, correlated and unified. But as most brands attempt to reach their customers on different channels and devices, the data being collected becomes fragmented across the organization and is difficult to take action on. Successful brands understand the important role humans play in the evolving technological landscape. It’s critical we understand and continue to learn key strategies, tactics, and recommendations on how to optimize the customer journey with human capital and technology. According to eMarketer, consumers spend almost 4 hours per day on their mobile devices. That’s almost 1500 hours in a year that brands have the opportunity to provide incredible mobile experiences, no matter the device, location or channel their customer is interacting on. Many brands are unsure how to set up a seamless mobile experience, how to optimize their mobile apps to deliver the best experience possible or even how to install SDKs. Business models are fundamentally changing based on the experiences consumers are having with brands. And this disruption is driven by data -- the language of those relationships. Organizations are now understanding the power in data to guide an experience and understand what consumers are telling them. Having a clearly defined data strategy is a necessity in creating exceptional moments with customers and ensuring long-term brand loyalty. Yet most organizations aren’t sure which strategies and methodologies need to be implemented to ensure accurate and seamless alignment of data within the overall business strategy. The NBA Utah Jazz wanted to unlock the power of its customer data to offer personalized ticket packages and offers. Its previous strategy – where all users received the same marketing messages at the same time – did not utilize customer data insights and served only to promote the offers the team thought were best, rather than listening to the needs of customers. Watch this main stage presentation from Digital Velocity San Francisco to see how the Utah Jazz adopted a new approach that enabled them to fully understand each individual customer and serve personalized offers according to their past behavior and preferences. When it comes to your experimentation program, you’re only as reliable as the data you use. When customer data is siloed and fragmented, it impacts the user experience and internal operations. You need to ensure your team is leveraging the most comprehensive visitor and event-level data to build better cross-device user experiences and create highly targeted experiments and personalization strategies for audiences. Data should not be underestimated as it is a company's greatest asset. The ability to collect customer data from multiple sources of interaction and act on it in a unified way is key to generating leads, increasing conversions and improving customer experiences. Machine Learning (ML) is a new field, and there is a competitive advantage to those first adopters. Yet, many companies are buying ML technologies and developing strategies before they have taken the appropriate step back to evaluate whether their data is ready or not. In this webinar, we’ll explore the evolution of Machine Learning as part of the broader data science discipline, and discuss why the fundamental need for data readiness is so crucial. Learn key steps to evaluate the readiness of your data and review how a governed data supply chain using automated orchestration can deliver a reliable engine for Machine Learning platforms today. 85% of CEOs believe technology will transform their business more than any other global trend, according to PwC. And at the heart of that digital transformation is customer data. Attendees will learn how to pair your best-of-breed marketing technology with robust data strategies to deliver the experiences your customers expect most. Data is the main contributor to business growth and your strongest competitive advantage. And real-time data insights can increase revenue within your business. But with an infinite number of data sources to consider, standardising on data collection and management is a complex process. Data is the most important asset a business has and it’s everywhere, but harnessing it to be used in a powerful way can be a challenge. Trusting that it’s clean and accurate can be even harder. So how do you actually channel all your data from disparate sources and use it to create web experiences for your customers that inspire and delight? The webinar will end with a live fireside chat on tactics, tricks and recommendations you can put into play with your own organization to start making your brand's data more strategic starting today. Organizations that want to compete in today’s fast-paced consumer market know that customers must be at the center of everything they do. This means providing the right experience at the right time, which requires real-time data and the the correlation of data across all customer experiences. Brands are turning to Customer Data Platforms (CDPs) and Data Management Platforms (DMPs) to help capture, correlate and manage their customer data, but many are confused as to exactly what each technology is and which solution is better suited for their organization based on the feature set of the platform at hand. The webinar will conclude with a live Q&A Chat with questions from the audience on all things CDPs and DMPs. Consumers are engaging with brands across multiple touchpoints, channels, and devices, generating massive amounts of valuable data. Organizations are quickly adopting a number of solutions to keep up with this explosion of customer data and better capture and correlate user behavior. The webinar will conclude with a live Q&A Chat with questions from the audience on all things enterprise data storage. Creating a true ‘customer-at-the-centre’ approach to business is key in delivering relevant, personalised experiences across online and offline channels. Having an agile identity resolution strategy in place is critical to achieving this type of experience, yet many are unsure on how to drive such a powerful and personalised consumer engagements. 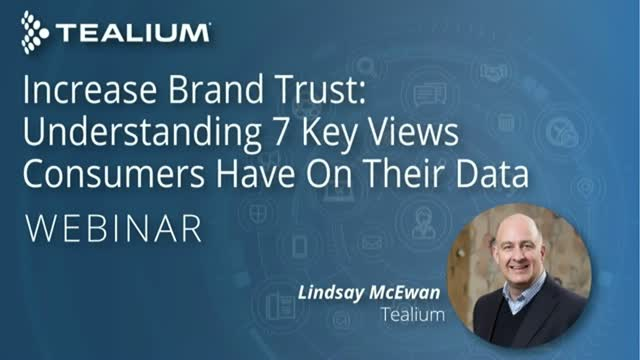 Tealium powers the new era of real-time customer engagement and marketing, enabling global businesses to unlock their customer data and create more meaningful, relevant customer experiences. The company’s industry-leading customer data platform, comprised of an enterprise tag management solution, omnichannel customer segmentation and action engine, and suite of rich data services, creates a vendor-neutral data foundation that spans web, mobile, offline and IoT.